Mouse cursor has disappeared after upgrading to Windows 10? This may happen irrespective of whether you use a wireless or a wired mouse. 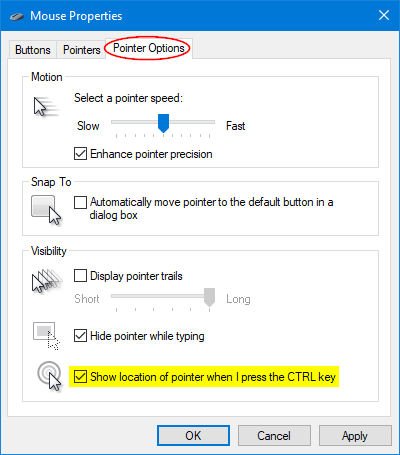 In this tutorial we’ll show you how to enable Windows to show the location of mouse pointer when pressing the Ctrl key. How to Find Location Of Mouse Pointer Using Ctrl Key in Windows? Press Windows key and R key at the same time. 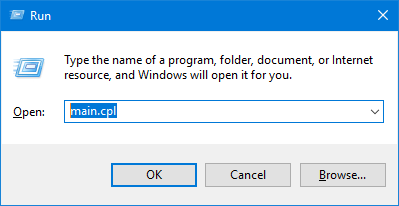 When the Run box appears, type main.cpl and hit Enter. In the Mouse Properties dialog, select the Pointer Options tab at the top. Check the box “Show location of pointer when I press the CTRL key” and click OK.
From now on, you just need to press the CTRL key to find and show the pointer location on the screen.